Ivar Avenue and Selma Avenue between Hollywood Boulevard and Sunset Boulevard; Sundays, 8 a.m. – 1 p.m.
3655 South Grand Avenue; chichenitzarestaurant.com. 2715 Vermont Canyon Road; laparks.org. 366 North La Cienega Boulevard; largo-la.com. 611 North Fairfax Avenue; cinefamily.org. – Paying the extra $12 or so to get priority boarding was definitely worth it!! Otherwise it is essential to check in as close as possible to exactly 24 hours before flight time so you get a good position in line, preferably A group or failing that B group but NOT C group. Those folks get the middle seats and there’s less likelihood, if the plane is booked, of getting an overhead spot to stow their luggage. The one flight I didn’t take and pay the extra $12 I got an A44 number in line – not bad. And I ended up with a good aisle seat close to the front of the plane (so I could exit quickly and make my connection). Guess which airport I am in right now? Yes, it’s Vegas. 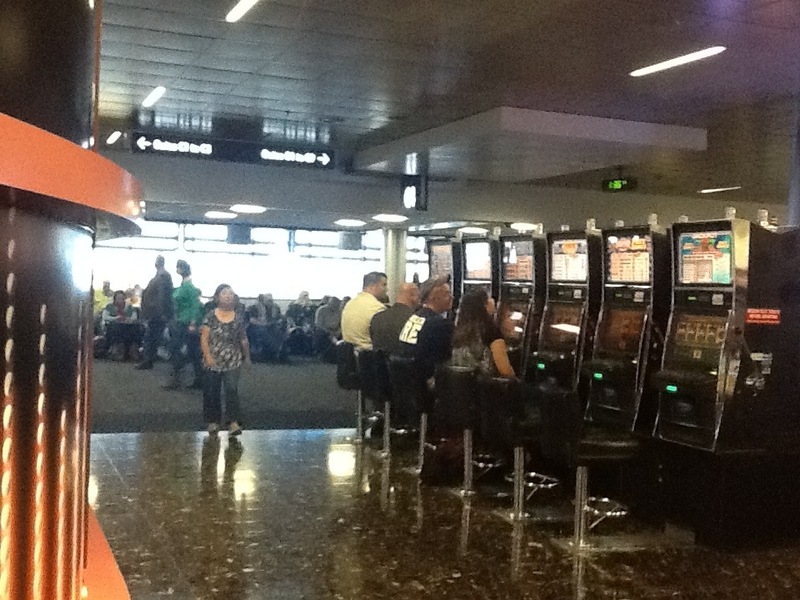 Where else are there slot machines in the airport? (Reno? Atlantic City?) although it is a spectacular day here, sunny, 70s, my connecting flight to Los Angeles is delayed about an hour due to late arriving equipment, although I am told to stick around since we could get a substitute plane and leave earlier than two hours from now. My inaugural flight on Southwest out of Des Moines went well. It’s been several years since I flew Southwest and never before from Iowa since Southwest arrived only within the last year and this Vegas flight is only a few months old (and so remarkably affordable). But I soon remembered why I like Southwest. It feels like a younger, more efficient even hip airline compared to the older creamier ones. The staff are cheerful and helpful. And the boarding process seems much less chaotic than it used to in the old days when there was what felt like a free for all to get a seat and overhead luggage bin spot. Now you have a boarding group letter and number so you line up accordingly. My B8 got me a very pleasant aisle seat near the front of the plane. All good. And I had free access to some tv shows on my iPad, although none were worth watching. here’s hoping my LAX flight goes as well.